Mary Higgins Clark, (b. Mary Theresa Eleanor Higgins Clark Conheeney December 24, 1929) known professionally as Mary Higgins Clark, is a suspense writer with 42 bestsellers in the U.S. and various European countries. Her books have sold more than 80 million copies in the U.S. alone. Her debut suspense novel, Where Are the Children, was published in 1975. Two of her novels were made into movies. Mary Higgins Clark also co-authored several suspense novels with her daughter, Carol Higgins Clark. Mary Higgins Clark began writing at a young age. Her fame as a writer was achieved against heavy odds. Her father died when she was just eleven years old, leaving a struggling family of four behind. After high school, she attended secretarial school so she could get a job and help her family financially. She also worked as a flight attendant for Pan-American Airlines before marrying her much older neighbor, Warren Clark. In order to supplement the family’s income, she wrote short stories. After the death of her husband in 1964, Mary Higgins Clark worked for many years writing short radio scripts, until she decided to try writing novels. Her first novel, a fictionalized story about the life of George Washington, was not a success. She decided to pursue suspense novels instead. Her debut mystery novel was an instant hit. Mary Higgins Clark was interested in writing at an early age. At age seven, she composed her first poem and often crafted short plays or wrote in her journal. When Mary Higgins Clark graduated from grammar school she received a scholarship to attend an academy run by nuns. There, she was encouraged to develop her writing. Mary Higgins Clark’s first attempt at publishing her stories was when she sent an entry to True Confessions, which rejected the story. After high school graduation, Mary Higgins Clark decided to attend a secretarial school on a partial scholarship. After course completion, she started her first job as the secretary in the internal advertising division at Remington-Rand. Throughout the years, Mary Higgins Clark attempted to find a publisher.Finally, in 1956, after six years and 40 rejections, Extension Magazine agreed to purchase her story for $100. 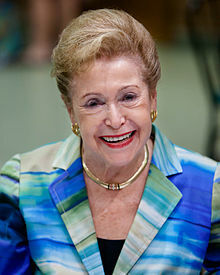 Mary Higgins Clark’s contract to be a radio scriptwriter obligated her to write 65 four-minute programs for the Portrait of a Patriot series. This experience taught Higgins Clark how to write cleanly and succinctly, traits that are incredibly important to a suspense novel. After the death of her younger brother, which left her the sole surviving member of her family, Mary Higgins Clark threw herself into her writing, and soon finished her first suspense novel. Soon after Mary Higgins Clark completed the novel, Where Are the Children?, Simon and Schuster agreed to purchase it for $3,000. Three months later, in July 1974, the paperback rights for the novel had sold for one hundred thousand dollars. Where Are the Children? became a bestseller and received favorable reviews. Mary Higgins Clark sold her second suspense novel for $1.5 million.